Complete and, in all probability, early overgrowth sagittal suture (sutura sagittalis) and the left half of the coronal suture (sutura coronalis). Preserved and continued to function only the right half of the coronal suture and not overgrown frontal suture (sutura frontalis). The normal growth of the edges of just the right half of the frontal bone and the sides of the adjacent bones led to a sharp deformation of the anterior part of the cerebral skull. Premature overgrowth of only one sagittal suture usually increases the skull; the width turns out to be significantly limited. At the same time, the activity of the coronal and lambdoid sutures continues and the skull grows in the longitudinal direction. As a result, deformation occurs, known as scaphocephaly. Brain skull, in this case, is long and narrow and resembles a boat, turned keel up. An exciting group of deformities of the human skull is deformities caused by a premature overgrowth of certain seams. 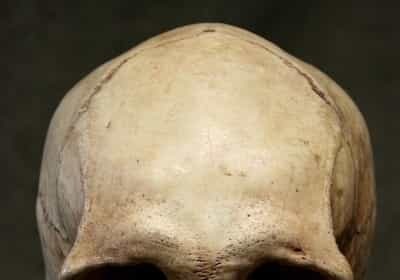 In cases where one of the seams is overgrown, and rising edges of the bones here is terminated, while the other joints continue to function, there is a violation of the harmonious growth of the skull as a whole. This naturally leads to its General deformation. What causes premature fusion of some bones of the skull is unknown. It is possible that this phenomenon is associated with some violation of the normal function of one of the endocrine glands. However, it should be recognized that there has not yet been a single fact that would indicate the existence of a link between the overgrowth of seams and the activity of any of the endocrine glands. Sometimes the early overgrowth is exposed not one, but several seams. This also leads to deformation of the skull. In those cases, when prematurely closed sutures such as coronal and sagittal, the small size of the upper section of the skull of the child are recorded, and their increase ceases. Since the growth of bones in the remaining sutures of the skull continues, the adult has a so-called “tower” head. The brain skull becomes elongated upwards and slightly backward.